Trevor Noah was born in Johannesburg in South Africa durin the reign of the apartheid or an interracial couple white father, South African mother. He is firs known as an actor and radio host, afterwards he dedicates himself to stand-up comedy which is beneficial to him and in 2009 he is noticed with his first one man show entitled Trevor Noah: The day walker. 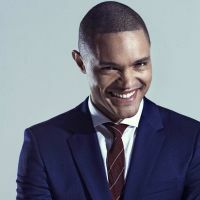 Trevor Noah moved to the United States in 2011, he made where he made very well noticed apperances being the first South African comedian on the very popular tv show '' The Tonight Show''. In 2014, he becomes the host of the Daily Show. He produced his 9th comedy Afraid of the Dark on air since February 2017 on Netflix.